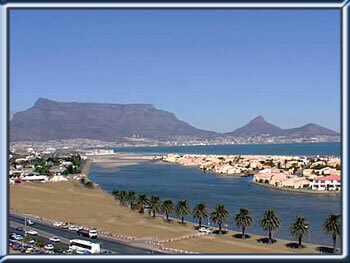 Milnerton has a rich history and has proved to be an invaluable component of life in Cape Town. Founded in 1897 by Milnerton Estates and named after the then High Commissioner for South Africa, Lord Alfred Milner, Milnerton rapidly grew into a prime holiday destination for residents of Cape Town. The introduction of a railway line in 1903, operating between Cape Town and Milnerton was a major factor in the development of Milnerton. The Milnerton Municipality has over the years been in the forefront of developing this town and surrounds in a very progressive manner. Milnerton is often seen as a general area including the following areas: Cambridge Estate, Century City, Milnerton Ridge, Sanddrift, Tygerhof, Woodbridge Island. These suburbs were all "add-ons" to Milnerton proper, which has clear boundary lines. The commercial/industrial development in the Milnerton area has also been very pronounced over many years, with the Montague Gardens, Killarney Gardens, Marconi Beam and other areas expanding rapidly with warehouses, factories and related businesses. The old Milnerton Racecourse, long an essential feature on the Cape horse racing calendar is currently being converted into a major housing development, giving rise to a new suburb of Milnerton, namely Royal Ascot. With xxxx housing units being built and major commercial/retail aspects, Royal Ascot will undoubtedly prove to be a major success. The houses in Milnerton itself are generally "older" type houses, having been built over the last 100 years. The streets in Milnerton are laid out in a grid pattern and are generally named in an alphabetical order. The residential areas of Milnerton are generally quiet, with tree lined streets and ample parks and green areas. Facilities in Milnerton include the full range of educational facilities, from crèches, pre-primary, primary and high schools. The Milnerton Library is one of the better libraries in the Cape. Milnerton Police Station is also ready to serve the community. An active ratepayer's organisation also looks after the interests of residents in the area. The Theo Marais Park provides a large sporting complex that caters for the needs of the sporting community in Milnerton. The Milnerton Golf Club is a true links course that has hosted major championship tournaments over the years. An active Surf Lifesaving Club provides essential services to beachgoers the holiday season. Service Clubs are well represented in the area, with the Milnerton rotary Club having recently celebrated its 25the anniversary. Most of the major retail stores are in the area and of course Canal Walk, the largest shopping centre in South Africa is located on the outskirts of Milnerton at Century City. As regards the property market, Milnerton can be regarded as a middle to upper class suburb with a large sectional component. Most of the free standing properties are large with well established gardens. Property prices start in the region of R600 000, with prices appreciating rapidly. With a mixture of free standing homes, sectional title apartments, sea facing houses, golf estates and a wide variety of other property types, Milnerton is sure to have something for everyone. Looking for property to buy or rent in Milnerton or wanting to sell property in Milnerton?